Long time no blog. Things are non stop but I like it like that. 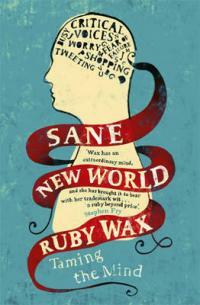 Since my last post, I have seen Ruby Wax again who's book Sane New World is now OUT! She spoke at 5 x 15 at the Tabernacle in Notting Hill. Such a great evening (I sat behind Joanna Lumley!) - another post on that will follow once the video clips have been released. In any spare moment since the minute I got my hands on it (on the tube or bus and even under my desk at work...! ), I have been nose deep - loving every word of it. Its just so cleverly written and easy to follow. Laugh out loud funny but also deadly serious and essential reading for pretty much everyone. A real master piece. I am near the end of the book now but will re read it as there will definitely be parts that I didn't take in (I wasn't being Mindful, which is what the book focuses on) - here is Portia Nelson's brilliant poem, which Ruby reminds us of on page 162. The wonderful Teenagers Translated team showed this to me a few years ago, so I feel I am one step ahead having seen it before.